"Live for the journey, not the destination." "The only journey is the one within"
We are in the middle of the woods looking at a tree with a doorknob on either side of its trunk. 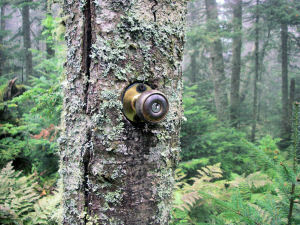 Yes, doorknobs, attached to a tree...I LOVE IT! Now I know why they call it Doorknob Junction! Did the person who attached the doorknobs to the tree want to make us laugh? Or did he happen to have extra doorknobs in his backpack and want to lighten his load? Or was he saying something much deeper? Whimsy or soul-searching? Doorknobs are everywhere in our lives, even in the places you least expect them, like out in the middle of the Vermont woods in the col between North and South Dorset. Each doorknob is an invitation to take the risk to enter and see what is behind the door and where the path beyond may lead. Once we choose, we walk through the doorway into a new realm unavailable to us just moments before. I love the mystery of not knowing what's behind a door, the thrill of adventure and new possibilities when I open a door to find out what it holds for me. The choice feels a bit more serious when the doorknobs I'm contemplating will change my life. I worry about whether I am making the right decision. Actually, I don't think we can open the wrong door, or make an erroneous decision or take a bad turn, in the woods hiking or in life. Every choice we make is the perfect choice for us in that moment. The door we open may lead us down a path filled with new experiences and excitement, calamity or confusion. But through every door we learn something new about ourselves -- something that informs us, through our participation, about our next choice, and the next door we open. And we can't go back, ever. Even if we try backing out the same way we came in. We can't un-know what we learn by opening a door, so even if we retreat, we are different when we close the door behind us. We are changed by the choices we make and the experiences they bring. Pat and I decide to go straight at Doorknob Junction and almost immediately find ourselves going down. That doesn't feel right since we are trying to get to the summit of Dorset Peak, so we turn around and head back to the Junction to make a different choice. Next we turn right and head steeply up, a hopeful sign. When we arrive at the height of land, we find the remains of an old fire tower and a gas grill, but no summit canister. We figure this must be the lower of the two Dorset peaks and we head back down, now clear on what door we need to open next. We take the only path we have not yet taken. 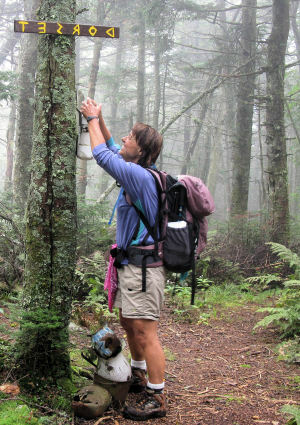 There is a sign on the doorknob tree pointing left that says North Peak. Now we know that it is North Peak that is the higher peak, the one that counts. Up we go and in no time we spy the canister that lets us know we have arrived on Dorset summit, our 83rd of the New England Hundred Highest. Each choice perfect. Each decision gives us information that narrows our choices, until we make the turn that brings us to the summit. But I am glad for the turns we took in our search. Of the 123 mountains we have successfully climbed, this is our first gas grill on a summit! Plus, the knowledge gained in our search will enable us to write a trip report that will be helpful to those who follow behind us, because we are now clear on the way and can guide others. That's a gift of the journey. Once we've mastered the way, we can offer guidance to those who come after. The doorknobs on Dorset remind me of the many professional doors I have opened in my life and the resulting experiences that have helped me discover who I am, what drives me, what makes me feel whole. There were times I applied for jobs and did not get them, the doors remaining locked, a sure sign I was not supposed to enter. Other times I did not even see a door, but someone appeared holding a door open for me, inviting me in, offering me a new opportunity. Other times I followed my instincts and wound up at an unknown doorway, ajar, beckoning me in, and I didn't think twice! Sometimes I chose between door number one, door number two or door number three. I worried and wrote pro-and-con lists and asked people for advice before turning the knob and walking through. Each choice perfect. I worked in Corporate America for 12 years as a communications manager for an insurance company, focusing mainly on helping employees and agents feel good about their contributions to the organization. I grew up professionally there, finding my enthusiasm and exuberance for creative fun projects. I managed to work my way up the ladder to become an officer of the company. I even had my own parking spot! I was sure money and prestige would make me happy, but once I got there, I found it was not what my heart wanted. During the same time I volunteered for the Monadnock United Way for 10 years and loved every minute of it - ahhhh a clue to what engages my heart -- feeling like I am doing something that matters. From there, with great trepidation, I went out on my own and found myself starting Center Stage, a nonprofit organization. I invented and directed community festivals in downtown Keene, including the Pumpkin Festival. I knew I was right where I was supposed to be and found my passion for thinking big on Keene's Central Square. I felt such joy and fulfillment announcing the 23,727 lit jack-o'-lanterns at the 2000 Pumpkin Festival, surrounded by family and volunteers and a celebrating community. I left after nine years knowing in my heart I had done what I needed to do. I had discovered me in a very deep way. From there I consulted with a large healthcare network, driving from one clinic to the next, coordinating an internal communications program which reminded employees of the tremendous gift they give in caring for others. That relationship grew into becoming a development director for a hospital and then for an arts and fitness organization. Those experiences helped me clarify my passion for meaning and the truth. Now I am working for a dear friend, Ruth Sterling, helping her advertising agency communicate their phenomenal strengths and gifts. STERLING Design & Communications' purpose is to serve the world by sharing their incredible talents. Not only are the people at STERLING brilliant and full of life, their clients are heroes, people working in organizations who care about those they serve, the products they make, and the communities they live in. Who wouldn't want to be a part of that? I have also been subbing for a fitness instructor, teaching exercise classes for a wellness organization and have found that I love the camaraderie and thrill of becoming strong and fit together. I have discovered the life-cheerleader in me. Each turn, each new path provided me with opportunities to get clearer and clearer on me - my message - my life. Some jobs have felt great, some felt absolutely terrible, all were important. Each door I opened brought me closer to understanding who I am. Each job was a gift. I wish I could be content with the journey as it unfolds, but I'd like to know where I'm going. When will I arrive at Doorknob Junction again in my life? Where is my next doorknob? Where will it lead? For years I have been aware of a seemingly insatiable craving deep inside of me to matter in some incredibly important way, to make a huge difference on the planet. I don't know how. I don't even know if I am capable of such a thing. I just know it calls to me. Every day I feel this empty place inside of me that yearns to connect with thousands of people's hearts in such a magnificent way that they are changed by the experience. I know, I know...I probably sound delusional. But the truth is the ache is there. And each time Pat and I arrive back at Doorknob Junction to try yet another trail, the symbolism of trying a different doorway to see where it leads catches in my throat. I feel that familiar hunger for more and the raw fear that I will never figure it out, that I will never find the right door, and that I will leave the world, still craving more, still wanting to make a difference in a bigger, wiser, deeper, greater, more meaningful way. Doorknob Junction reassures me that there are doorknobs everywhere, invitations to grow abound, and that life is full of opportunities to discover my purpose. I know I am on the right path. My fears keep me alert and alive. My yearning keeps me turning doorknobs, opening doors and venturing out anew. My heart keeps me going in the right direction. And the journey brings me joy. 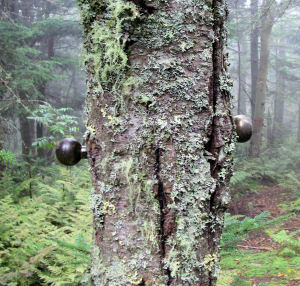 As we hike back down the mountain, through Doorknob Junction, I turn and take one last look at the doorknobs on either side of that tree trunk. I smile and take a deep breath, knowing I am ever closer to finding me.